In-line hydraulic torque wrenches are best suited for applications which are constrained by low height clearance. 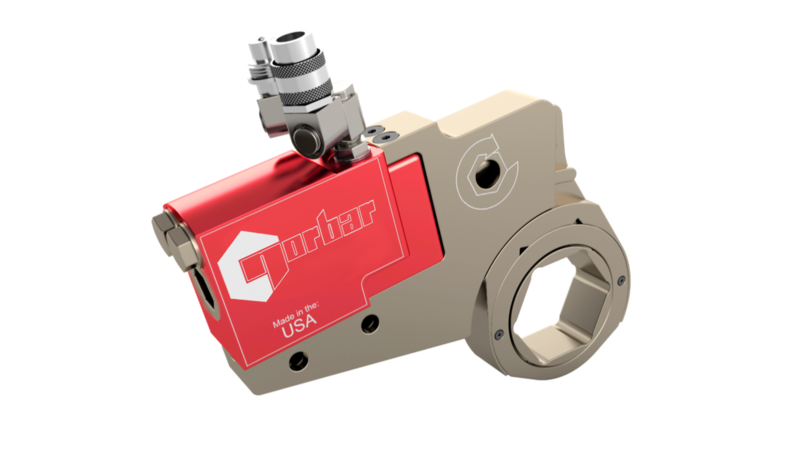 This state of the art Norbar NHC/L Series Hydraulic Torque Wrench design reduces the overall dimensions of the in-line ratcheting head allowing it to fit almost every application. Lowest overall radial clearance – rail design allows for a very small radius on the interchangeable low profile heads. In-line Ratchet Wrench – Standard head sizes from 19mm nuts across the flats. Metric and special sizes available. Precision Machined – Increases accuracy, durability and repeatability and reduces surface damage to the nut. Reaction Pad – A reaction pad built into the tool body allows the tool to react against the adjacent nut. Multi-Axis Porting System – allows the swivel fittings to be manually repositioned using only commonplace hand tools. Drive Pin Design – This patented design reduces the overall dimensions of the Hex Link Cassette head, including a thinner “nose” radius. As a result the tool is able to fit more applications. Cylinder – Made of durable, lightweight, high strength aircraft alloy with the same sturdy, dependable and accurate design (as a steel cylinder). Cylinder Body and Link sold separately.